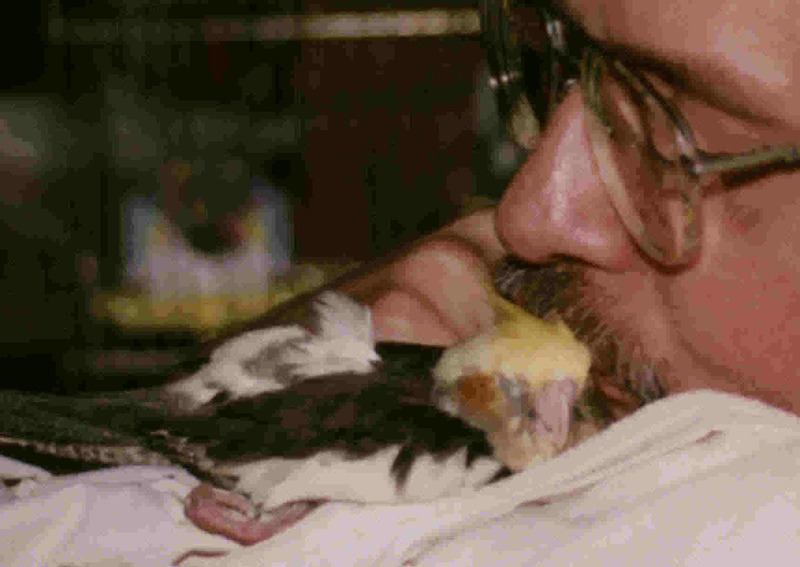 My wife Laura and I love birds, so we take in homeless and handicapped parrots, parakeets, canaries and doves. 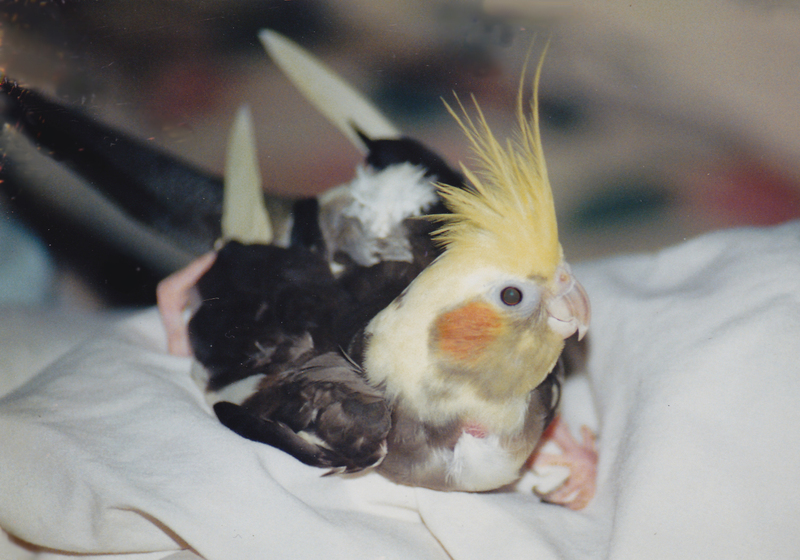 We once got a call from a lady at the Dallas Bird Club asking if we could adopt a young handicapped cockatiel. She'd been dropped off by a breeder who said she had no commercial value and could never be sold as a pet, and she'd been placed with a disabled man who turned out to be allergic and couldn't keep her. We went to pick her up and found her living in a shoebox with a felt bottom. The hard, confined quarters had ruffled her feathers, and she was the most pathetic little ragamuffin we'd ever seen. She was also a little afraid of hands, but her eyes would shine with delight when you got face-to-face with her. Her personality was so bright and cheerful, we named her "Rosey" and immediately fell in love with her. Rosey was born with one leg bent forward and the other backward so that she couldn't perch; and her spine was badly twisted, making egg-laying a torturous ordeal that over the years sparked several frantic midnight runs to the vet to save her life. But she managed to get around surprisingly well, albeit with great effort. We installed her in a terrarium with zip-lock bags full of water covered with towels to create a waterbed and prevent bed sores. She loved her little house, but I soon learned that she didn't want to stay there. She wanted to come out and be with me all the time. If I tried to cover her, she would chirp adamantly until I uncovered her again and brought her out. As long as she knew I was awake, she refused to leave me, even if it meant staying up all night. So for years, as I worked on the Comedy Wire in the wee hours in my recliner before the computer, Rosey would cuddle next to my cheek, nestled in a crumpled sheet over my left shoulder. On nights when I was tired and my head would start to nod, she would nibble my ear and wake me up to keep me going. During some times of family tragedies when I didn't feel much like writing comedy, her sweet, funny face and playful antics would make me laugh and cheer me up. And anytime I felt sick or discouraged or sorry for myself, I could always draw inspiration just from looking at her. She was one of the most vulnerable little creatures you could imagine, twisted and malformed, unable even to fly -- except when I would hold her in one hand, run down the hall, and let her flap her wings and pretend to soar, which she loved. And yet, she never seemed discouraged. She faced every life-threatening challenge with courage and grace, accepted her near-constant pain and uncomfortable vet treatments without ever becoming resentful of humans, and brought so much light and life and humor to our family, we used to say the whole house revolved around her. She became the mascot of the Comedy Wire -- you can see a photo of her on our website even today. When the end approached for Rosey, much too soon, her breathing became shallow and labored and she could barely bring herself to move, but she still wanted to be with me. I held her next to my cheek for nearly three days straight, keeping her warm and hoping for a miracle I knew wasn't going to come. When her final moment arrived at last, she suddenly stirred for the first time in days, as if she had caught sight of something in the distance and had to fly to it. She gave a little leap, flapped her wings as if taking off into the sky for the first time in her life...then fell, still and limp, in my hands. I was so torn apart by Rosey's death that even though it's been several years and we've had many other birds whom I love as well (there are 13 at this writing! ), she is the one whose photo rests on my computer, where I can see her sweet, smiling face every day. Seeing her reminds me of all the times she cheered me up when I was down, kept me going when I was tired, inspired me not to dwell on my troubles and pains but to press on and live life -- and how the way she left us made even an old agnostic like me wonder if maybe there isn't something on the other side of the sky that we will all someday reach for. Now, please allow me to remind you that all that was a gift from a little handicapped cockatiel that all the experts on assessing the monetary value of things agreed was worth precisely...zero. And that's the difference between what something costs and what something is worth. Merry Christmas from Laura and me and all our flock! We wish you all the gifts of the season, especially the gifts of real and lasting value!